In this post we'll show you how to use the nagios monitoring plugin to monitor your Drupal CMS installation using Opsview's application monitoring software. To be able to make the configurations in this blog post you'll need admin access on both the Drupal server and on the Opsview system. You will need to install a Drupal module and then install a Nagios plugin. Firstly you will need to go to drupal.org and download the Nagios monitoring module. or navigate to your Drupal GUI and via the “Modules” page, click “Install new module” and paste the hyperlink above. Drupal is now configured for monitoing with Opsview. 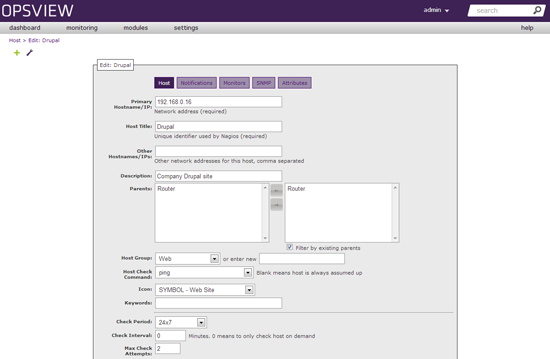 Download the “check_drupal” plugin from the Nagios Exchange and copy it to your Opsview system. and run a test command using the unique ID you set above. Then the “-U uniqueid” is not specified in the command, or set via the Drupal module. As the test is successful you can now proceed to building service checks to monitor your Drupal site. 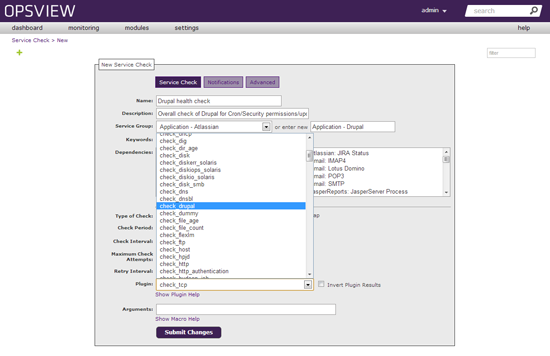 Login to your Opsview system via the GUI and then “Settings > Service Checks” and add a new service check via the “plus” icon in the top left. Where samsdrupalacquiasite is replaced with your unique ID you set earlier in this document via the Drupal GUI, and your URL replaces /acquia. This is because it seems Opsview cannot run the check commands (ping, etc) against an “IP/domain” style address. This -H .. option can be modified however, to your specific environment. For clarity, the only important setting in the above for the purpose of this document is the “Primary Hostname/IP:”, this should be your URL for the Drupal server, i.e. company.com for example. The new service check is now added to your Drupal site. Add any other service checks you would like also via this page, for example “Check HTTP”, etc.